I think this might be the first boy quilt I’ve made, and I love it! This one matches the Fuchsia Seas quilt, but uses blues, oranges and browns. Again, it’s mainly Heather Ross prints, from both the Mendocino and Lightning Bugs lines (I even convinced myself to cut into some of my goldfish fabric!). I do love how the lines can be mixed and matched. For the back, I happened to find some yardage of this seagull print, which is from the Heather Ross Lightning Bugs line. There’s a section of pieced strips from what I had cut off the blocks on the front, and a fun polka dot binding. 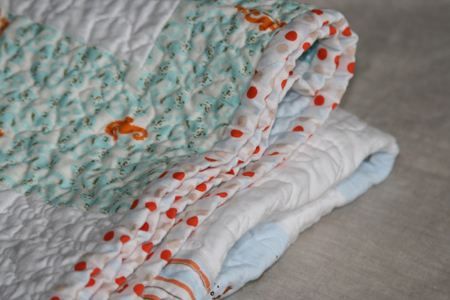 As with the girl version, this one is free motion quilted and is soft and crinkly… just perfect! A few of you asked about measurements for this quilt, so here you go! 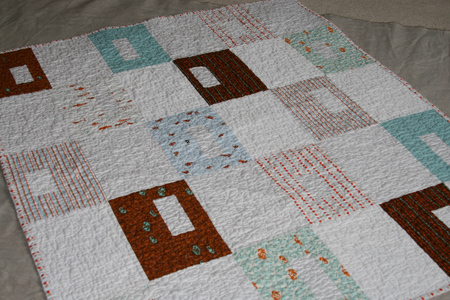 This baby quilt used 30 blocks, 15 solid white blocks and 15 patterned blocks. Each block is 7.5″ x 10.5″. For this quilt, I used 6 blocks for each row, with a total of 5 rows. The small center white rectangle in the center of each patterned block measures 2.5″ wide. The length varies, since I was going for a random look, but in the past I’ve done them all 2.5″ x 4″. The resulting quilt, after washing, measures 39″ x 46.5″. The white fabric is a cotton sateen that I buy at Joann’s. I use it for almost all my quilts. This entry was posted in [search] Other Quilts, 2009 Finished Quilts, Finished Quilts, Household Sewing - bags, napkins, pillows, Posts about Quilts, Quilts and tagged baby quilt, goldfish, handmade, Heather Ross, lightning bugs, quilt. Bookmark the permalink. Fabric in, fabric out… a little giveaway! i love this one. i bet it is super soft with all that heather ross fabric! i would have a hard time selling this one. especially with all that hard to find heather ross fabric. 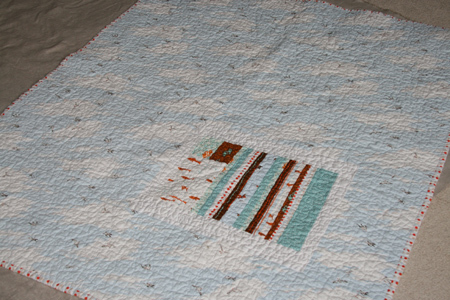 the seagull print is so perfect for a quilt back! I found it last summer and bought a couple of yards. If the rest is still there this summer (which it may well be!) then I’m buying whatever they have left. Some of ours became pj pants for my girl, and the rest is waiting for the right project. You have really sold me on the Mendocino prints. I hadn’t bought any, but now I think I should. So so cute all together! It’s adorable! I love it. I can imagine how soft it must be. This is excellent! I love the offset rectangles. love this one. i love blue and orange togehter. another great quilt! Hmmm . . . I do think a certain male would LOVE this, my dear CIL! What kind of fabric are you using of your whites? I love using muslin, but am about to try an organic cotton. Autumn – I actually meant to include that in my post… the white is a cotton sateen that I buy at Joann’s. I’ve tried a few whites and I really like this one. It’s more expensive than muslin, but it has a really soft feel which I like a lot. So so cute!! Love it. Were you bored making two of the same pattern at once/back to back? I’m getting so bored doing that! But it’s fast… I’m sure you’ll sell quilts like crazy! I love your baby quilts and I’m just finishing one and going to start another. I’m pretty sure I’m changing the design to match these! It’s so cute and shows off the fabric wonderfully. Thanks for the continued inspiration! I love this quilt! And I would even put it in my daughter’s room! Wow! Your blog is great (I just found it). I have so many ideas for new projects!! Thanks for sharing! This is so beautiful! Anyone have any idea where to find that Seagull fabric?? Megan – that print has been discontinued for a while, so it may be hard to find. Maybe Etsy or Ebay? I have some that I may be willing to sell if you’re interested… I’ll email you. I can’t believe you cut up your goldfish fabric! I keep looking at mine, but haven’t been able to cut into it yet. I don’t know how I missed the HR gull fabric. Will have to keep on the look out for it now. I love the quilt, the colors, composition, it’s so modern and awesome. I too love the sateen, so smooth and high quality. It is nice to see somethign for boys and it is very nice. Love how you used all the fabrics together and the polka dot binding is perfect! Where did you get the pattern for this? I want to make a quilt like this. it’s gorgeous! i love the crinkled look of it. Just discovered you site and as a fellow lover of the quilting, I have to say AWESOME and thanks so much for sharing with all of us. This is so awesome! I love it! I’m working on a boy quilt too with similar colors, what did you use for the binding??? Thanks Krystina! The binding on this one is a polka dot from Heather Ross’s Lightning Bugs line. The line is out of print now, but you can still find the dots online on ebay or etsy.